XXXTentacion announces he will releases a new EP tonight as an early Christmas gift for his fans since they are challenging his freedom. While he didn’t say where he will upload it and for how long, we are confident that you can stay tuned on his Soundcloud account. After seeing his court day postponed to December 15, XXXTentacion hasten to share his love with fan through social media and court information hoping fans will show up to support him. Rick Ross’ manager Black Bo passes away. When are the Supreme Box Logo releasing? Everyone wants to know who is the “Gang Gang” face-tattooed rapper from No Jumper’s Adam22 personnal Youtube channel. Where is he from ? Why does he have the Gang Gang tattoo ? The rope pope has helped launch lots of careers over the past 24 months, and however the latest promoted artists are just bypasser, they nevertheless rouse the public interest. Take a look at Wild Jackpots casino review. Best casino bonuses, offers for new players. After Jumex which has been labeled as “industry plant” due to his ties with Taco Bennet from Odd Future and his “Trapped” videoclip starring Asspizza. This time, lets make some room for Skarrss who has clearly a visual impact on the underground music consummers. While it is cristal clear that they the rapper are a discident branch of the Juggalo family, it surely wasn’t clear for the Rope Pope who has actually interviewed the Isane Clown Posse, about a week ago. Skarrss hails from Norway and hasn’t disclose his real name yet. He represents for F.O.C. Gang which acronyms stand for Family of Criminals. FOC Gang anti snitching clothing line campaign againtt drug. Were more like a worldwide united family\gang. That even has started a donate page so other can help us with one of our main goal and that is showin the REAL truth about drugs to the youth and givin them another opirtunity or lifestyle call it what you want.. so our MAIN goal is to help the youth stop to begin doing/selling drugs. 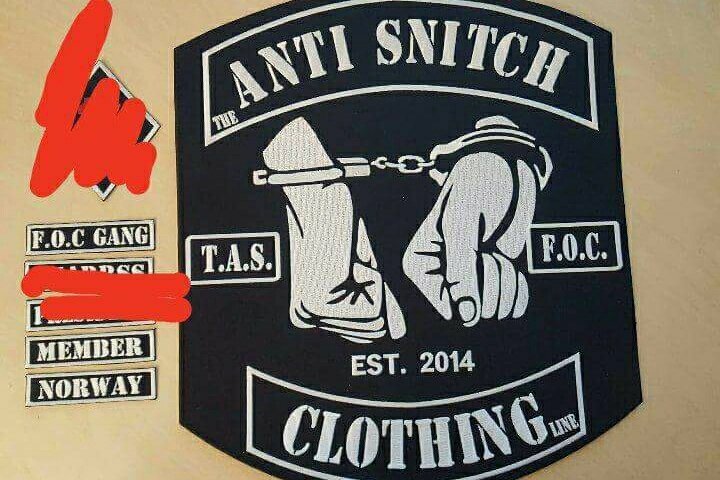 So we offer one free starter «the anti snitch clothing line.» starterpack to sell and then they will understand that they got other choises!! He also showed and received support from Arild Knutsen, Leader of The Association for Humane Drug Policy of Norway for the “Support, Don’t punish” movement. Arrested back in December, Lil Pump was kicked off a flight to Europe after TSA agents allegedly found drugs in a luggage left right behind him with a “Garcia” tag on. TMZ has obtained body cam footage of the drug bust, where Pump grows frustrated with TSA agents who refuses to believe his pleas, when he tells them that he didn’t walk in the airport this bag, and that it doesn’t matter if it does have a Garcia tag on it. Incidentally, the TSA agent then takes his refusal as an act of defiance, inciting yet another level of intensity in their argument. It’s pretty hard not to side with Pump on this one since he really seems to tell the truth. According to reports TMZ obtained, the Floridian rapper was in fact NOT holding any drugs on his person – much less a cannabinoid product falling within State regulations – which would have resulted in a ton of questioning and another legendary videoclip of high-end natural trolling. According To Lil Pump Everyone Want To Smash Kim Kardashian In New “Be Like Me” Single Featuring Lil Wayne. A day before the releases of his highly anticipated album ‘Harverd Dropout”, Lil Pump releases new track ating that everyone wants to smash Kanye’s wife. Tomorrow, Friday 22nd will see the beginning of a new era, as Lil Pump, will bless us with his new drip. After the “Ching-chong” controversy, the rapper compares himself to Kanye, and according to him everyone wants to smah his wife Kim Kardashian.